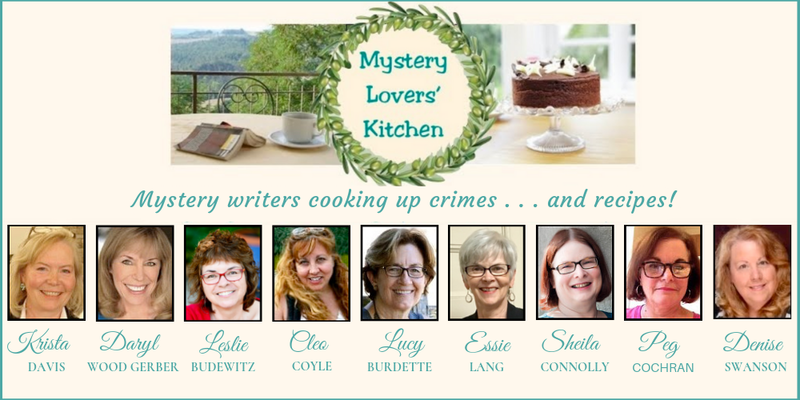 It's Thanksgiving week at Mystery Lovers Kitchen! You must eat. And enjoy! I remember Thanksgivings where all I ate were appetizers. 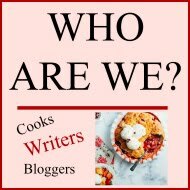 I adore turkey, but by the time the meal came around, I'd had so many delicious treats before, I couldn't even consider a taste of turkey (my favorite) and mashed potatoes (my second favorite) and cranberry sauce (okay, this might be my first favorite) and pumpkin pie (all right, truth? I never pass up pumpkin pie)...but you know what I mean. family and friends mingle. They stir the palate. Yes, of course, a cheese platter is always a wonderful appetizer. But here are a couple of appetizers that are just downright tasty! 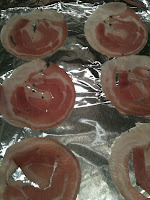 Cool pancetta and transfer to a platter. 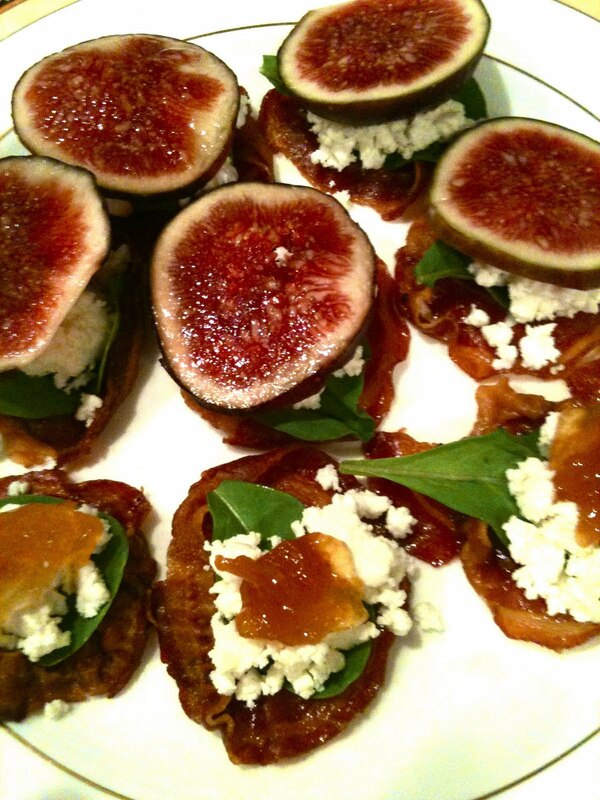 Top each pancetta with 1 arugula leaf, 1 slice of goat cheese, ¼ teaspoon of jam, and 1 small slice of fig. If desired, sprinkle with ground pepper. 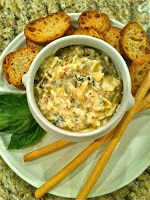 Chop artichoke hearts, basil, and olives. Pour into mixing bowl. Add cheeses. Stir well. Pour mixture into 4-cup baking dish. Serve with breads and crackers. ... for my gluten-free friends, I wanted to share a gluten-free stuffing recipe. That's right, stuffing! Made with GF bread. It's so delicious and so easy, it's scary. 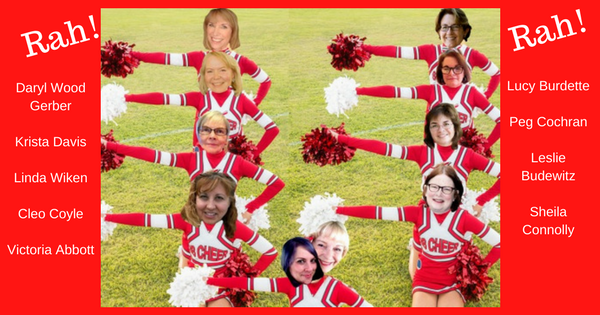 This was inspired by a new Twitter friend @glutenfreegirl. 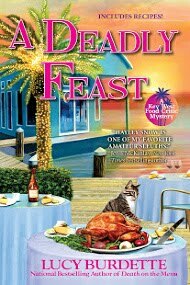 She has an ongoing romance with a chef and they put together a little video on stuffing. I tweaked their recipe to make it my own. In a saucepan, combine butter, broth, celery, onion, chestnuts, and spices. Bring to boil. Simmer for 10-15 minutes. Put the bread into a 9 x 13 casserole dish. Pour the egg/water combination over the bread. Pour the hot broth combination over the bread. DO NOT STIR YET. Bake in oven 30 minutes. If desired, broil the stuffing for about 5 minutes until crisp brown. If desired, this may be served with shredded Parmesan cheese. 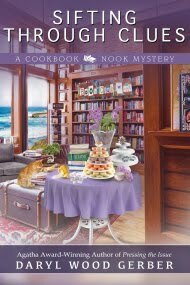 Finally...if you'd like to know more about A Cheese Shop Mystery series and want to download a few other recipes from me (on recipe cards), click on this link to my website: Avery Aames. 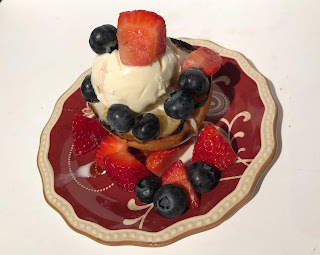 I've posted recipes in the "morsels" section. There's lots of other fun stuff, as well. 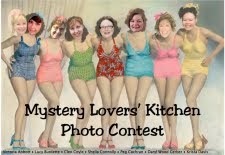 And sign up for the mailing list to get in on the next contest...coming soon. I'm so glad you've covered appetizers, Avery! I needed some fresh ideas, since I'm hosting Thanksgiving this year. :) Except that, especially looking at that delicious-looking artichoke-olive dip, I don't know if I can wait that long! Thanks also for sharing your Gluten-free stuffing...sounds amazing! I am being haunted from my childhood, my hands are still sore from being whacked with that kitchen spoon. Always a cheese and cracker tray. But that olive dip does look amazing! Excellent, Avery - thank you! I am always on the lookout for new appetizer recipes. We adore appetizers here and sometimes make them just to have as snacks around the house. These are wonderful. Thank you! Okay, Judy and Julie, I have to admit, I still like to put olives on my fingertips, too. Did anyone's mom make them an olive and mayonnaise sandwich? And sage in the dressing. Hmmm. I'll have to try that. Dave - you got your fingers whacked? For sneaking a bite? Ouch! How many times until lesson learned, I wonder. Thanks, MJ, for stopping by. 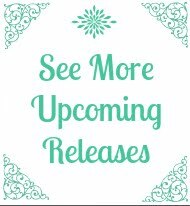 Busy weeks ahead for all! I'm definitely going to make the artichoke dip you posted. Sounds wonderful, and like one of your other readers said, I'm not sure I can wait a week to try it! Thanks! Beth, it really is yummy. Because there were only four of us eating the appetizers, I had leftovers, so I spread the artichoke dip on toast the next day and grilled it open-faced. Oh, wow! A perfect lunch. Oh, darn it, Avery. It's now lunchtime here in NYC and your post has made me crazy-hungry for all of your delicious fare. I'm with Beth! Artichoke dip is a must-make! And the pancetta with goat cheese and peach preserves...oooooh, yum. Also love, love, love your photos of the fresh figs, one of my all-time faves, too. I better stop now or you'll be seeing me at your front door with an empty plate in my hands. Cheers and Happy Thanksgiving! Cleo, come on over. I've got plenty of food! All delicious .... I'm definitely going to try the pancetta and goat cheese yummy thing! Well now I know why I waited till now to take a look. I would have been starving. 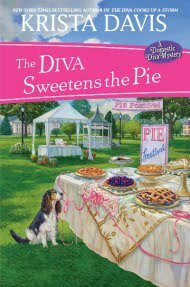 I love all the recipes Avery, I am going to have to try them all. Avery, these would be wonderful for a holiday party, too! These are absolutely lovely appetizer, Avery! 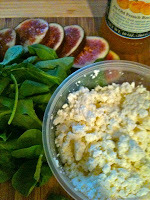 The combo of flavors must be incredible...I'll look for figs at our grocery though I don't recall seeing them there before...makes me miss our San Diego days where they were plentiful. Wishing you and yours a great Thanksgiving!!! Count me in as another cheese & apps lover! Avery, these are fabulous! And olive sandwiches, oh yes! I've got hubby hooked and he loves to put olives on almost any kind of sandwich now!